in which my clients you attacked. than allegations containing neither law nor fact. The claims you make are nothing like the truth. You, sir, are a complete pettifogger. would believe such a whopper. and a judge would view your claim with disfavor. and attorney fees nothing herein is a waiver. we suggest you advise your client to remediate. Call if discussion you desire. 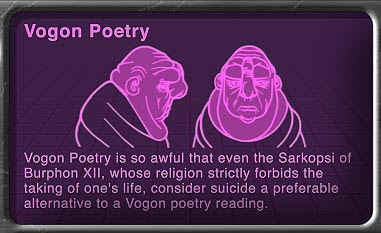 This entry was posted in humor, vogon poetry, Well I thought it was funny and tagged lawyers, Shakespeare, sonnet, Vogon Poetry. Bookmark the permalink. I think I Know that loathsome toad!